December holiday fun is in full swing, and there are so many things to do! What’s at the top of your list this season? The National Christmas Tree? A festive bar crawl? Or maybe just some sweet jazz in a decked-out hotel? Whatever your preference, there's something on our weekend roundup for everyone. Here's your weekend roundup for Thursday, December 6 – Sunday, December 9. OC's first Comic Con is bound to be a jam-packed day of fun that revolves around art, anime, comics, and cosplay. You’ll be able to look through the work of over 100 vendors and artists, including Alicia’s Anime (anime and video game-related apparel and items), Candy Corpse (pins and sassy socks), The Comic DoJo (a gaggle of comics), and many more. Every holiday season, more than 40 boats are adorned with colorful lights and decorations on the Annapolis waterfront, circling the area in two different fleets. This year’s boat parade will occur on Saturday, Dec. 8, from 6 to 8 p.m. Whether you’re looking for a romantic date night, an outing with the whole family, or just one of the most “Maryland” ways to celebrate the holidays, this is where it’s at. Winterfest of Lights is an Ocean City tradition! Grab some hot chocolate and board the Winterfest Express to take a one-mile journey through one million holiday lights and hundreds of animated light displays. Pile everyone into your car for the annual Lights on the Bay! For the 24th year, you can take a two-mile scenic drive along the Chesapeake Bay to see all kinds of light displays — both animated and stationary. Kids can take part in a scavenger hunt, too. Admission begins at 5 p.m. There are plenty of outdoor Christmas markets to choose from, but the German Christmas Village (at West Shore Park in Baltimore’s Inner Harbor), has proven to be a success year after year. Plus, it has European charm! Modeled after the traditional Christmas markets in Germany, the event is such a unique, authentic German experience that boasts more than just shopping! Based on the Will Ferrell movie we all know and love, Elf the Musical is playing in Olney this holiday season! The story of Buddy the “elf” has captured hearts all over the world and is a great way to get you into the holiday spirit. Buy tickets here, and then read OCN’s review of Elf the Musical! Nothing screams winter and the holidays quite like ice skating! Bundle up the kids (or your significant other) and take them down to Baltimore’s Inner Harbor to the Pandora Ice Rink. Check the ice rink’s website for more information. Easily one of the coolest trade shows in the world, Winternational celebrates culture, trade, and tourism from countries all over the globe. Enjoy live music, cultural demonstrations, and dance performances in a bazaar-like atmosphere as you wander up and down the aisles. To view the full list of over 50 embassies that will be participating, visit the event website. Every Friday this month, the gorgeous and classy St. Regis Hotel will serve hot chocolate and play live jazz in their decked out lobby. It’s the coziest way to spend date night -- not to mention, it's incredibly romantic! And make sure you dress nicely, because the St. Regis lobby is worth a photo for that Instagram feed. Catch this classic show to not only get you into the holiday spirit, but to also reflect on everything wonderful in your life. Take your friends, family, kids — everyone will enjoy and relate! Plus, the show is at Ford’s Theatre, which is worth a visit all on its own. Get your tickets for the show here. Running along the canal, Georgetown GLOW runs nightly through the holiday season. This absolutely gorgeous outdoor display of lights makes the perfect backdrop for a romantic after-dinner walk or late afternoon family stroll. And it’s free! It’s time to pick up the Christmas tree! The Georgetown Christmas Tree Farm will have a nice selection, and after you’ve picked out the perfect one and had someone help you load it into your car, you can come into the cozy lobby of the Ritz Carlton Hotel and enjoy some hot cocoa that’ll warm you right up. Take the fam to see ZooLights at the National Zoo, in all its 500,000 LED light glory. This year, make sure you check out their new attraction, the Symphony of Lights — where an interactive light canopy responds to music! 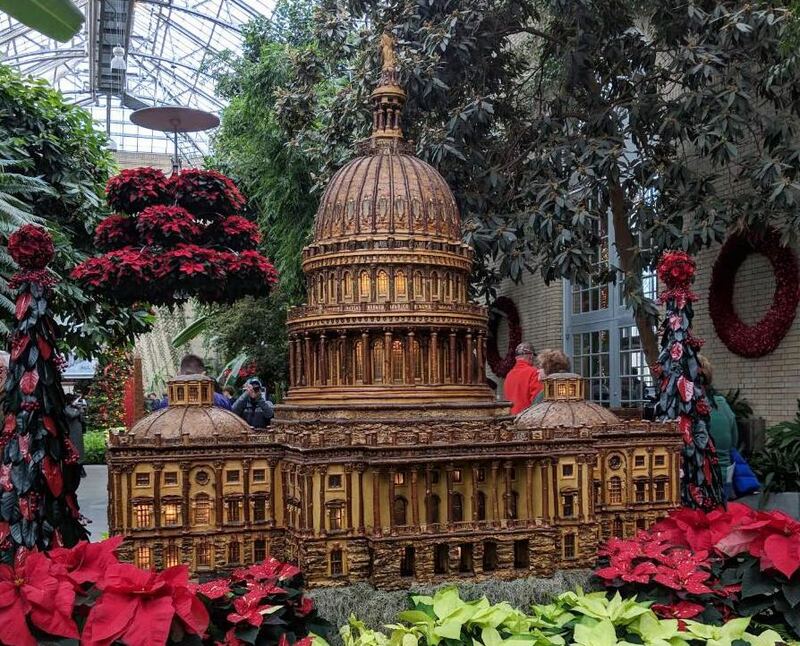 Every year the Botanic Garden puts on a holiday show, and this year they’re showcasing famous train stations around our nation, decorated (of course) with the most stunning holiday-themed details. And the best part? It’s completely free. The show takes place every day from 10 a.m. to 5 p.m. Check out the Botanic Garden’s website for more information. Looking for a quaint, fun holiday outing with friends and family? Don’t miss the Downtown Holiday Market this season in Penn Quarter/Chinatown. Featuring 150 local and regional vendors, the market will be open from noon to 8 p.m. every single day. Read more information about the D.C. Downtown Holiday Market. Here's another charming, small-town holiday festival for you to check out this Saturday. Historic Occoquan has everything you could want, from a parade, live music, hot cocoa, and maybe a glimpse or two of Santa Claus. It will also be a great place to get some of that holiday shopping done and find unique gifts for everyone on your list! Get more information here. What’s more fun than a holiday bar crawl -- especially if it’s in the Del Ray neighborhood of Alexandria. Your ticket will get you drink and food specials, entry into the raffle, tons of games, and so much more. Virginia Beach’s first outdoor ice rink is open! The cost is $15 per person (including skate rental) or $7 per person if you have your own skates. This is bound to be a very popular attraction this holiday season, so expect crowds and be prepared to practice some patience. At over 68,000 square feet, Pentagon Row Ice Rink is the largest outdoor ice skating facility in Northern Virginia. Nestled between the restaurants and shops of Pentagon Row, the ice skating rink is a favorite with locals for a great family outing. Don’t have skates? Not to worry: all sizes are available for rent. Featuring traditional Chinese lanterns and state-of-the-art lighting technology, LightUP Fest is a light festival that celebrates a rich cultural heritage. Entertainers of all types, foods from all over the world, and more than 70 light displays are all key to making this event an incredible experience for the whole family. What’s on your must-do list for December? What did we miss on our list? Share with us in the comments below!